When i lived in NYC, South America was a hop away. Every Latin American country has their own version of Ceviche. Hope you like this one. Ok! for those of you who don't care much for "raw" seafood..or don't get ultra fresh shrimp... the key is to immerse the shrimp, shell on, into a pot of boiling water for about 2 mins. This will cook them. Let them cool, remove the shell, devine them and chop them into pieces. For those of you who do get fresh shrimp, you can follow the recipe below. Add the tabasco, salt and cilantro and mix well. Press down on the mixture a little to let the juices seep out and mix. Serve with tortilla chips or fresh crusty bread. Please note that if you do use the raw shrimp as i did.. the acid in the lemons and tomatoes will "cook" the shrimp. The one pictured above has its reddish cooked colour and the acid did the trick. P.S. Flagged as Beautiful and Unique. 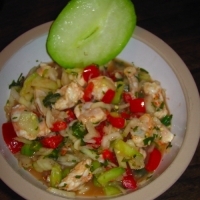 Richard I love ceviche and I have a good recipe that I make for special occasions. I love the addition of Jicama in your recipe. Like uk2nyc's recipes? Never miss an upload!